I don't know if he was outside on the Lake over Kennedy Expressway one. 59th over the Dan Ryan would sure be a fright. 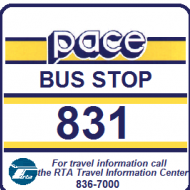 Actually it is a new wrap, if you go back to my rodeo pictures #2893-94 is sitting in Skokie Shops without a wrap. I also remember seeing #2797-98 with Xmas decorations inside it but no wrap, so it's possible the seat inserts and interior decorations are the same but the exterior is new. that wrap is the same as last year's train I have the photos to prove it. If you are seeing deja vu, it's because it's the same set with the same wrap as last year. 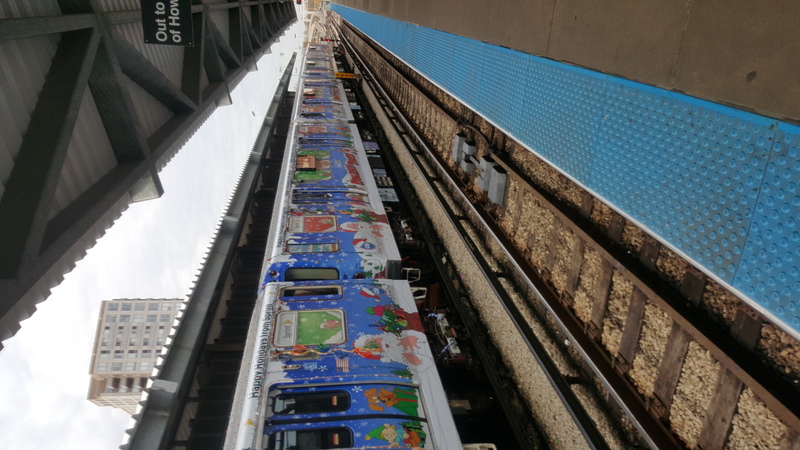 Yes, i also saw the set unwrapped at Skokie during the Annual Roadeo and was shocked to see the basically same Holiday Train for 2013 schemed the exact same way for 2014. Now to the untrained eye, many will not notice, but to the very few, a little startling. So your point is it's the same wrap design. I was just mentioning it was not the same physical wrap as I thought you meant that it was the same wrap not taken off in 2 years. But I believe there were a few shortcuts as I saw interior decorations at the rodeo. While some things might need replacing, other things like the interior lights, seat inserts are probably the same. Maybe they did go over the candy striping and the interior wrapping but of course the whole exterior was redone. 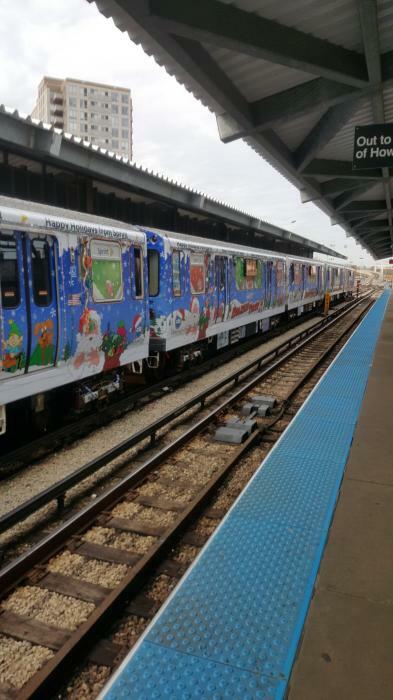 That's the advantage of only using these cars for the Santa Express. Just spotted it leaving Belmont to Linden. Still looks great. I finally got some shots underground with my kids mother and aunt. which was wise on their part. Wow, indeed it was a wise move. Garmon757....Did you read my post .....it wasn't just "a wise move"...rail control makes that same move EVERY TIME with the Holiday Train. With only six cars and crowds of people wanting to take pictures, the Holiday Train gets delayed as it makes trips along every line. MetroShadow said they let five road trains pass the Holiday Train. I watched on Train Checker and two trains were allowed to pass on the evening trip. So, rail control is using practices learned over the years. P.S. Haven't seen you on Facebook Chicago L.
In fairness though, I haven't rode it on the NSM since 2009. I would've assumed that the train would get the heck out of dodge, but it happened. This says the guy who was concerned about the overcrowding than the assignment of the track. Makes a lot of sense actually. 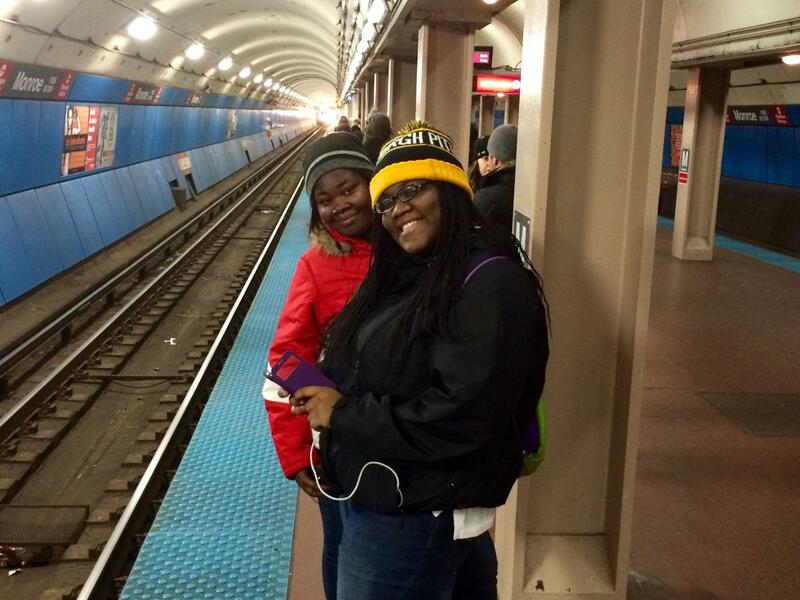 I also didn't know there was a Facebook Chicago L thing. 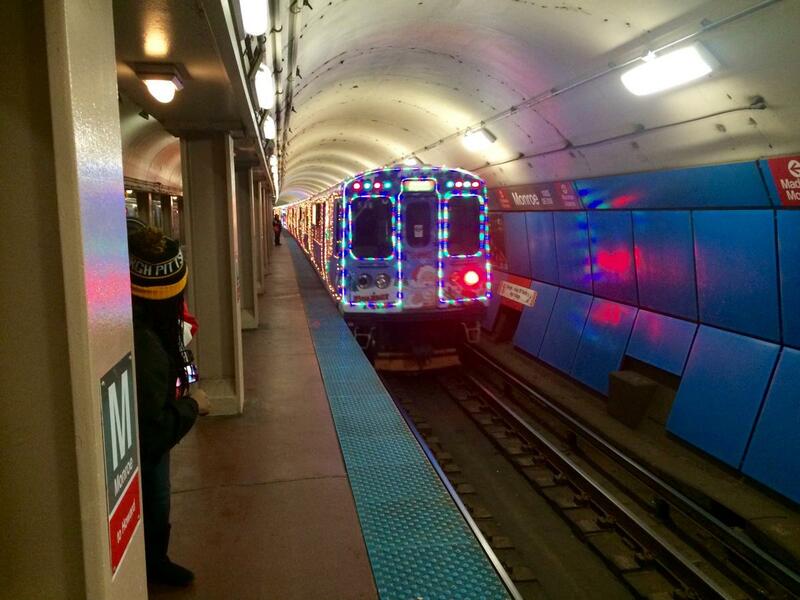 Door problem on the Holiday Train at 63rd. It's moving now though. I did and that's understandable. I've been busy finishing Christmas shopping for my kids. That's why I haven't been on Facebook as of lately. No one rode Monday's Red line final trip? I here it was annulled....doors! Me and the mother of my kids saw it last night at 79th but we decided not to get on because people were getting way too crazy and we were heading to Chicago Ridge via #381. ...Me and the mother of my kids saw it last night at 79th but we decided not to get on because people were getting way too crazy and we were heading to Chicago Ridge via #381. Looks like you dodged a delay there. Red Eye has the story, and some tweets from disappointed riders. So I'm assuming the train is being converted back to normal. I didn't respond to MetroShadow because I couldn't place where he was coming from. I could have be afraid of Thomas....LOL. Is that Thomas? Looks like Percy or Gordon to me. I sent a join request to the group about a week ago, but nothing happened so far. 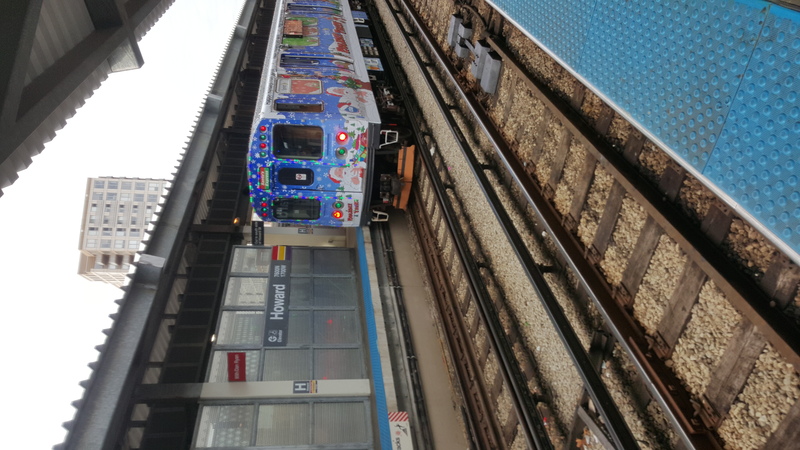 Just spotted this year's Annual Holiday Train leaving from Howard Yard to Skokie Shops. 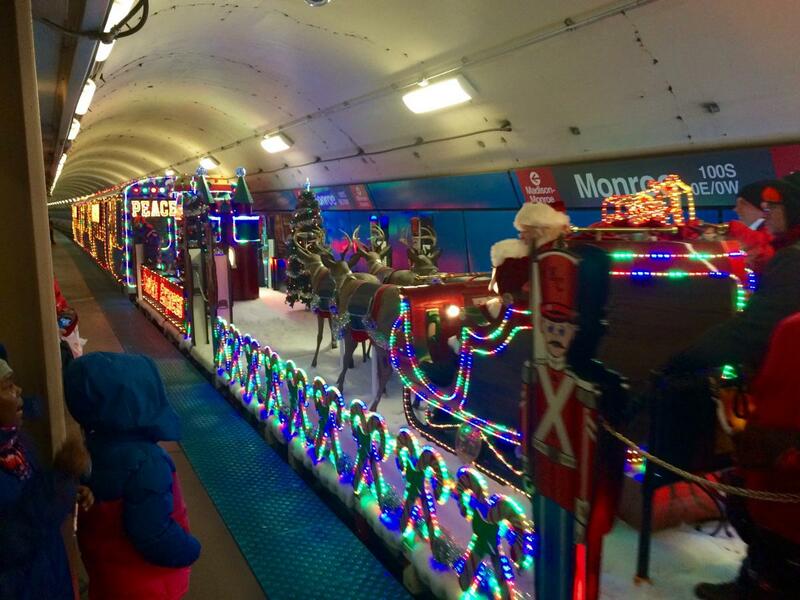 Should have a Press Release about the Holiday Train and the schedules as assigned next week. Why they were deadheading to Rosemont is surprising... 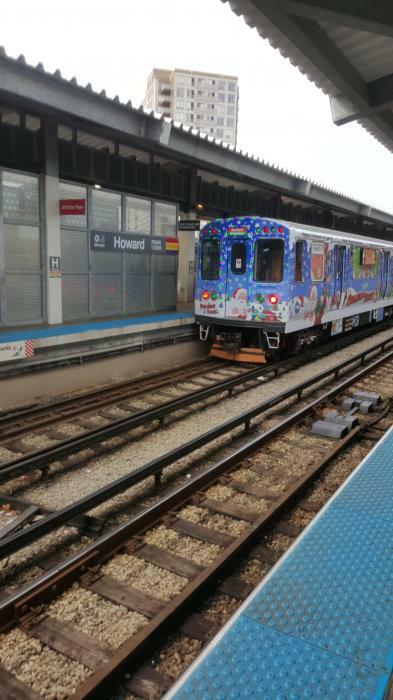 I thought they'd get serviced, "dressed" and prepared at Skokie Shops to Howard Yard. 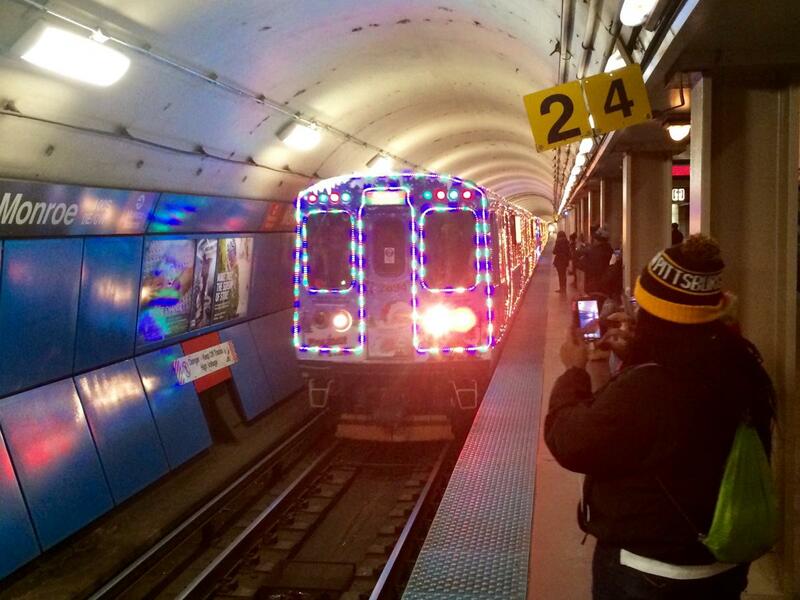 Who said the Holiday Train was going to Rosemont? 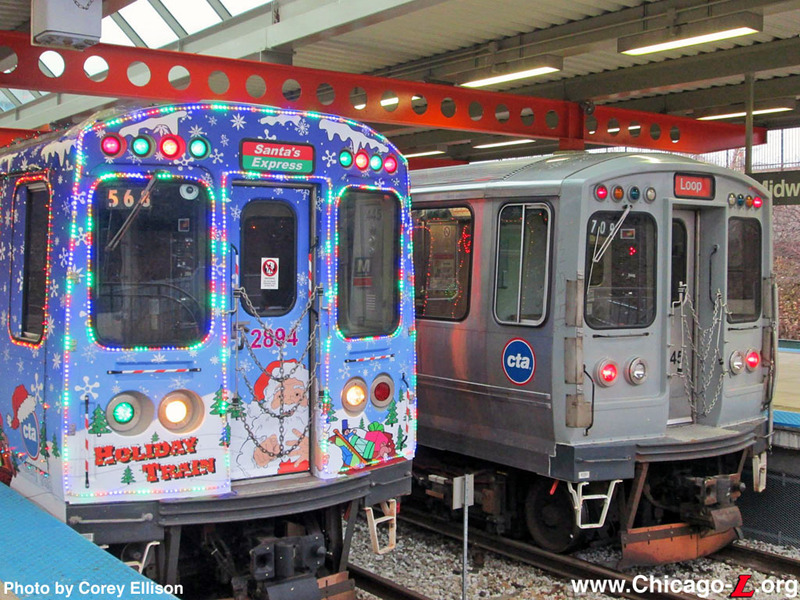 Chgofan said........"Just spotted this year's Annual Holiday Train leaving from Howard Yard to Skokie Shops." Well there was a post above mine that said the train was spotted in the Dearborn Subway deadheading to Rosemont... that post has since been taken down apparently. I should've tagged it. I'm not making this up.... 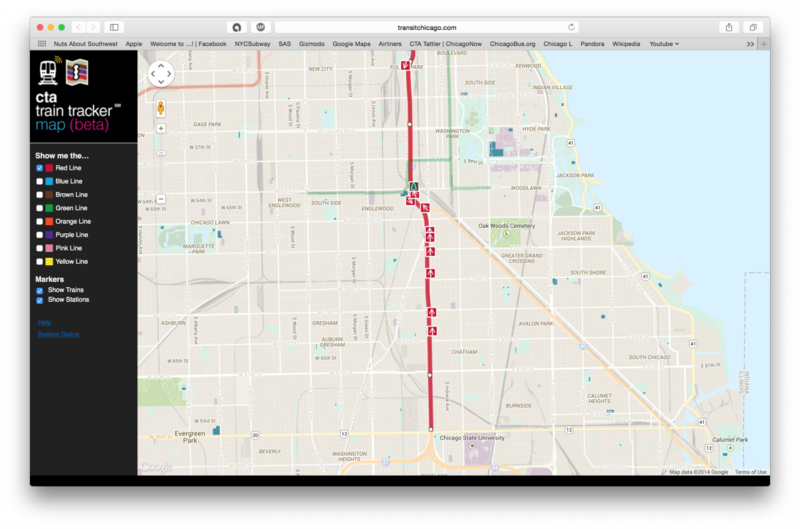 I saw the words "Blue Line Subway" and "Rosemont" in a post. Where that post went and if it was corrected, I don't know. I hope the poster who did put it will be courteous enough to mention their mistake. 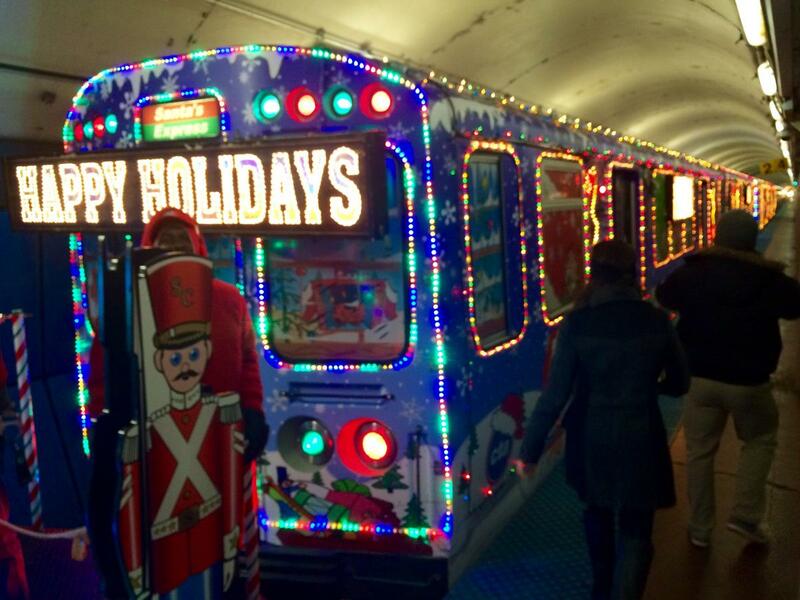 Well, with annual Magnificent Mile lights festival approaching, a hint was dropped within this year's set list of the tree-lighting parade and the cta is a participant within the parade. 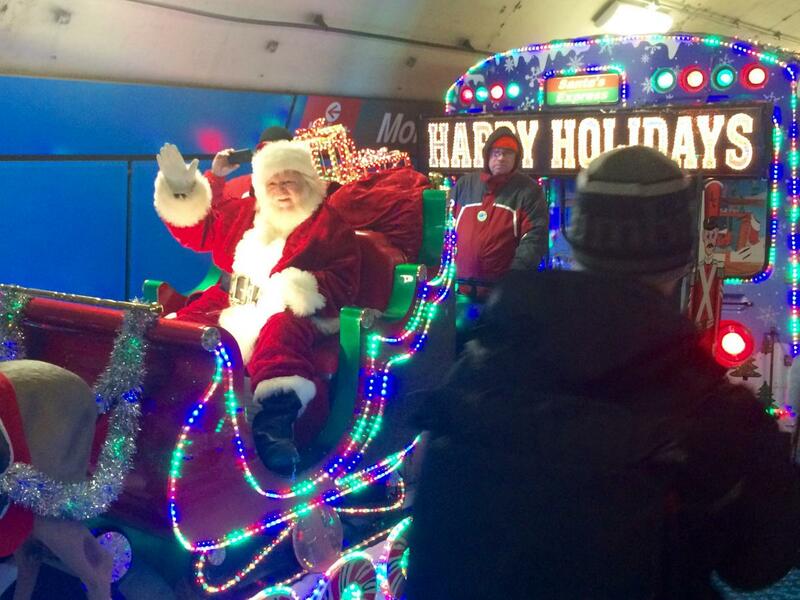 One has to wonder, will the Holiday Bus return for 2015? I would expect (and anticipate) for an OFFICIAL press release this week! Here are a few quick pics I took of the Holiday Train yesterday. It literally was only there for less than 45 seconds. Looks like the same wrap again but modified with advertising for Sprint, which makes it look really tacky. In past years, the corporate sponsors got to advertise in stations but not on the train itself. Apparently Sprint got too greedy so maybe they'll end up on Santa's naughty list. I wonder if they will have ads inside the train as well. Could be worse. 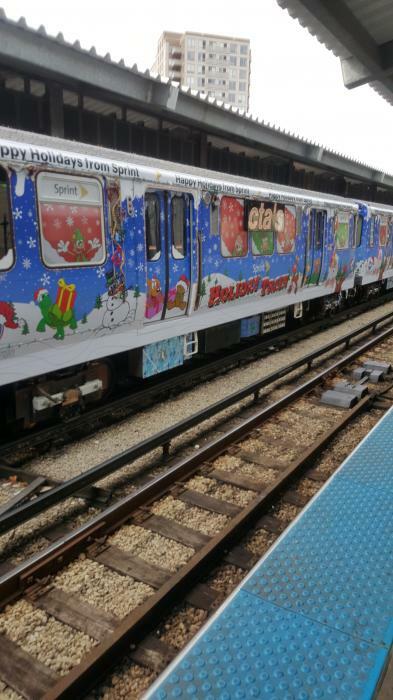 Could be AT&T, but they would sponsor the Grinch train. 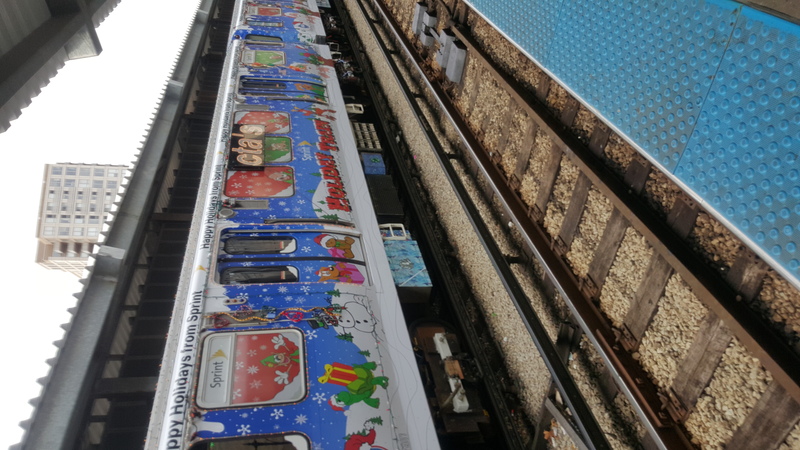 So does Sprint sponsoring the train mean the train will have wifi onboard and it will be usable everywhere, even at the O'Hare tunnel?